Department of Mathematics, Faculty of Basic Science, Shahed University, Tehran, Iran. Let $S$ be a dense subsemigroup of $(0,+\infty)$. In this paper, we state definition of thick near zero, and also we will introduce a definition that is equivalent to the definition of piecewise syndetic near zero which presented by Hindman and Leader in . We define density near zero for subsets of $S$ by a collection of nonempty finite subsets of $S$ and we investigate the conditions under these concepts. D. De and N. Hindman, Image partition regularity near zero, Discrete Mathematics, 309 (2009) 3219-3232. D. De and R.K. Paul, Image partition regularity near zero with real entries, New York Journal of Mathematics, 17 (2011) 149-161. 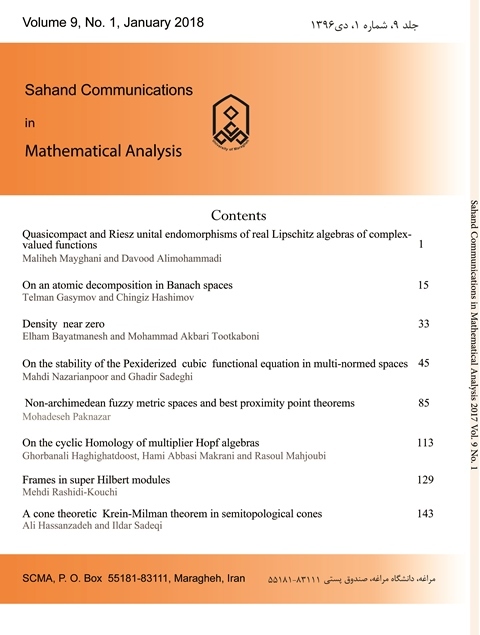 D. De and R.K. Paul, Combined Algebraic Properties of IP* and Central* Sets Near 0, International Journal of Mathematics and Mathematical Sciences, (2012) 1-7. E. Følner, On groups with full Banach mean values, Math. Scand, 17 (1955) 243-254. A. Frey, Studies on Amenable Semigroups, Thesis, University of washington, 1960. N. Hindman and I. Leader, The Semigroup of Ultrafilters Near 0, Semigroup Forum, 59 (1999) 33-55. N. Hindman and D. Strauss, Algebra in the Stone-Cech Compactification, Theory and Applications, de Gruyter, Berlin, 2011. N. Hindman and D. Strauss, Density in Arbitrary Semigroups, Semigroup Forum, 73 (2006), 273-300. M. A.Tootkaboni and T. Vahed, The semigroup of ultrafilters near an idempotent of a semitopological semigroup, Topology and its Applications, V. 159, Issue 16, (2012), 3494-3503.